Vision-Ease - BrainstormOverload - Small design studio. Big ideas. 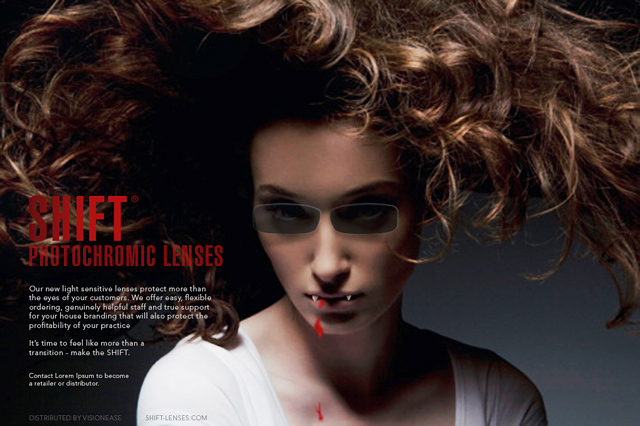 We were brought in to help the agency Eleven brand and develop an aggressive campaign to promote a new line of photochromic lenses being brought to market by Vision-Ease. The campaign needed to include both b2b and b2c channels. We came up with eight directions including this one with the product name Shift. 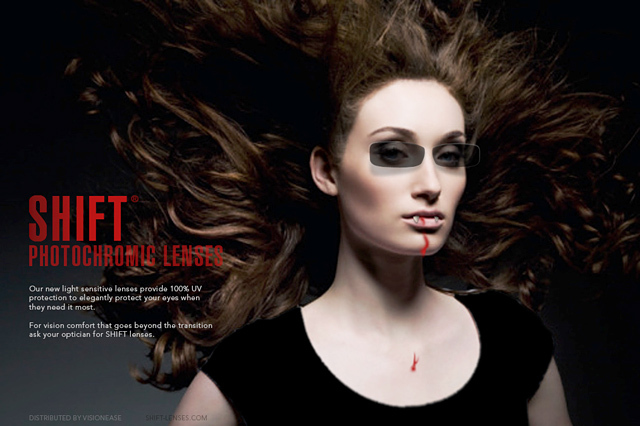 The visual approach employed dramatic fashion photography of vampires who are protected from the damaging rays of the sun by lenses that provide 100% UV protection. To ensure these are not mistaken as promotions for frames and to add an additional layer of surprise the lenses hover in front of the models without any frames at all.